Luxury 2 bedroom penthouse villa, epitome of elegance in tropical paradise featuring a private plunge pool and modern fully equipped kitchen in Kata. 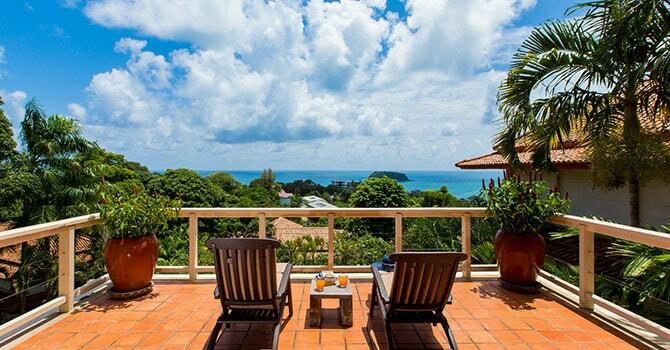 Located on the most beautiful Surin Beach in Phuket, Sawan Anda is a stylish 3 bedroom 3 level villa that can accommodate 6 guests. This oversized 2 bedroom villa is a glorious island escape with panoramic views and a shared infinity pool in popular Kata. 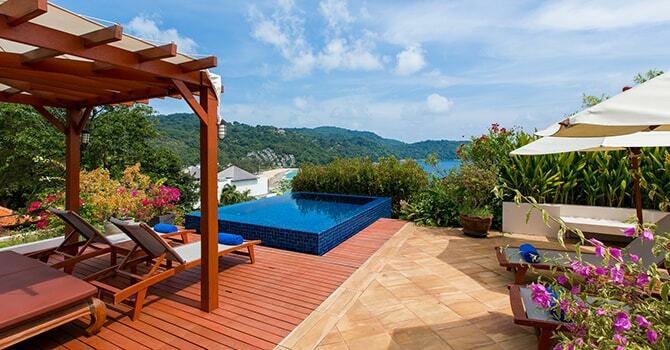 3 bedroom ocean view villa, a sumptuous haven nestled in lush, verdant jungle with spectacular garden and ocean views. This expansive villa in Kata is a beautiful 3 bedroom tropical oasis with delightful sea views and a stunning private pool as well as a BBQ and alfresco dining. 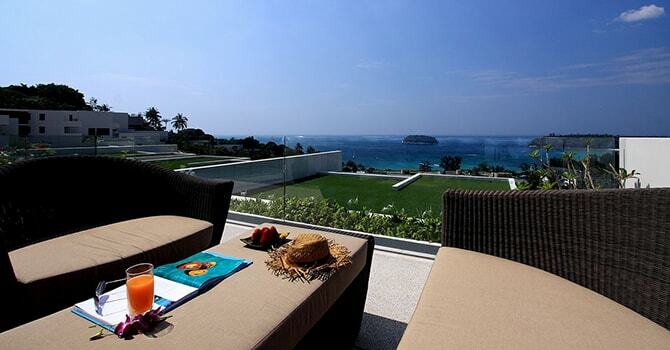 Sea view villas sit in the hills just above Phuket’s beautiful beaches. On cliff tops and high up on hill tops the panoramic view of the sea all around can be incredible. 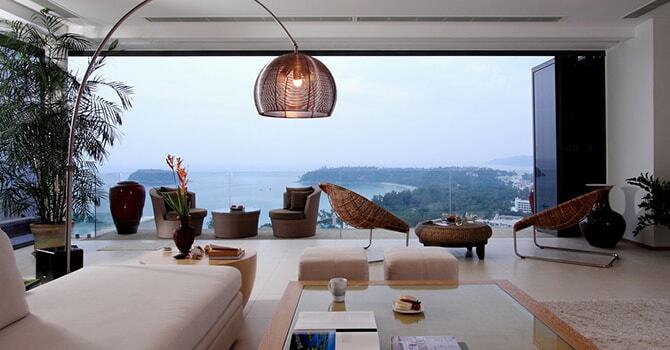 With more space available it is the sea view villas that tend to be bigger inside and out. Expect manicured lawns sloping down to pool decks and an infinity pool. Large areas for groups to relax and enjoy themselves together. And sea views in every direction. Often from every room in the villa. With all the extra space you can expect the very best array of amenities like games, fitness and cinema rooms, aswell as spa, steam and saunas. To make it as easy as possible to find the best villa for your group, please find the bedroom range links below. Here you can find all the villas that will accommodate the number of bedrooms you will need. On each villa details page you can view the price for the number of bedrooms required. 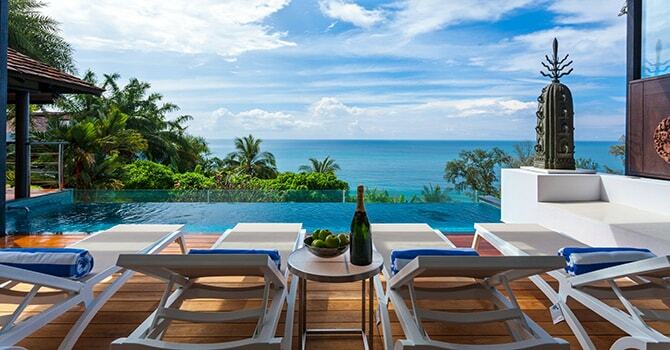 Suitable for couples, families and small groups searching for a private villa vacation. The most common villa size and with all the facilities you could need. Enjoy fitness, games, cinema and spa rooms, aswell as sea views from infinity pools overlooking the beaches and sea. Accommodating larger groups with big spaces indoors and outside, making it easy to travel together and much better value than a hotel.